Four MIT faculty are among the the 168 fellows of the National Academy of Inventors elected in 2015. 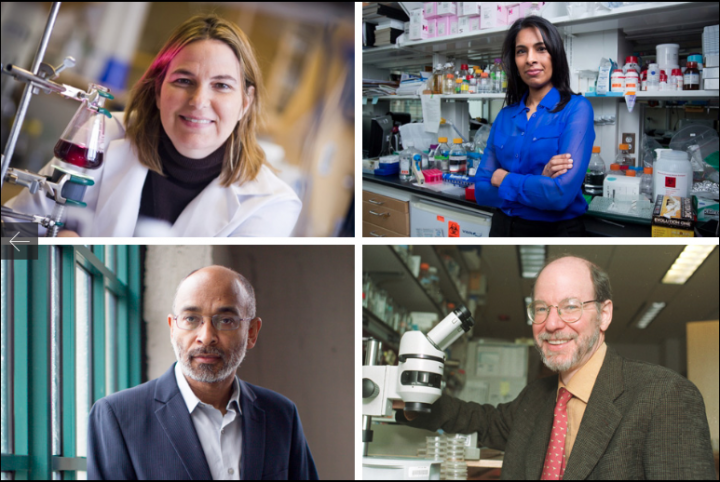 They have been honored for their "prolific spirit of innovation in creating or facilitating outstanding inventions that have made a tangible impact on quality of life, economic development, and the welfare of society.” (Clockwise from top left): Angela M. Belcher; Sangeeta N. Bhatia; H. Robert Horvitz; and Emery N. Brown. Credit: Belcher photo by Dominick Reuter. Bhatia and Brown photos by Bryce Vickmark. Horvitz photo by Donna Coveney. Sangeeta N. Bhatia is the John J. and Dorothy Wilson Professor at MIT’s Institute for Medical Engineering and Science and Department of Electrical Engineering and Computer Science in the School of Engineering and a Howard Hughes Medical Institute investigator. She is a member of the Koch Institute for Integrative Cancer Research, the Ludwig Center for Molecular Oncology, and the Harvard Stem Cell Institute, an Institute Member of the Broad Institute of MIT and Harvard, and a Biomedical Engineer at Brigham and Women’s Hospital in Boston. Her laboratory is dedicated to leveraging miniaturization tools from the world of semiconductor manufacturing to impact human health.